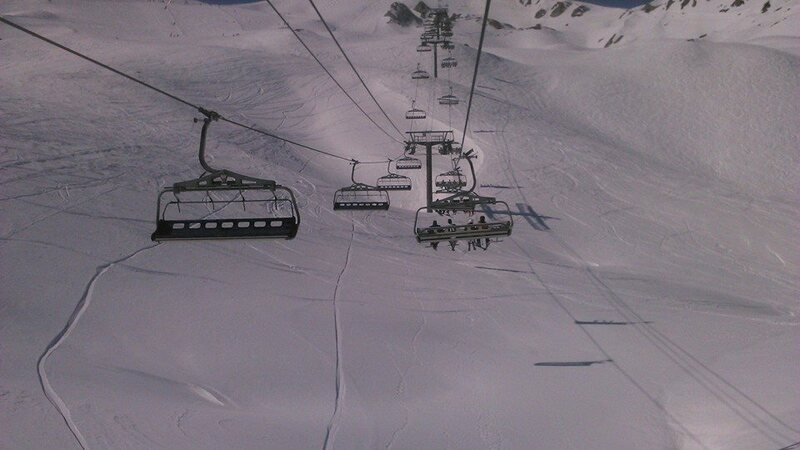 Ever since I watched skiers from the longest highest unsupported gondola in the world I have wanted to try it. I was having the trip of a lifetime with my aunt. 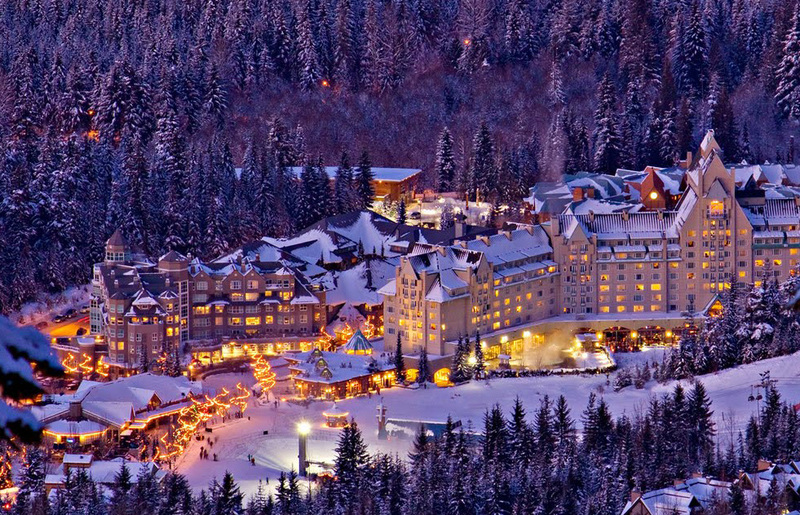 We took a coach from our hotel in Vancouver and drove for hours towards Whistler resort. 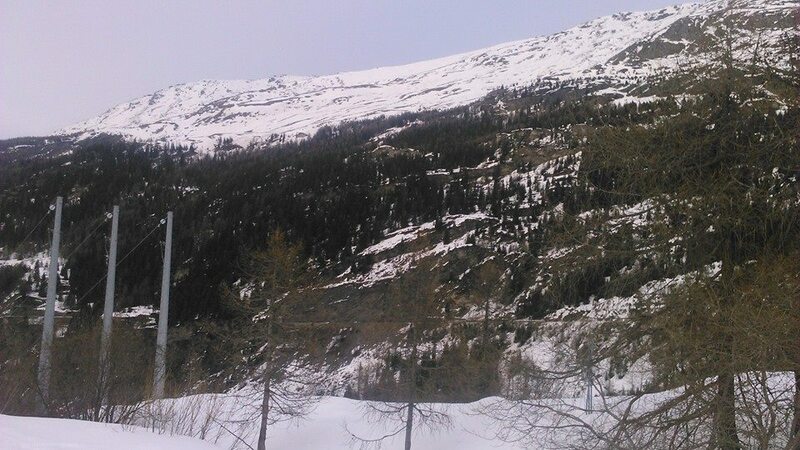 After going past a large lake with a backdrop of snow-capped peaks we began to ascend and the snow started and deepened around the road. 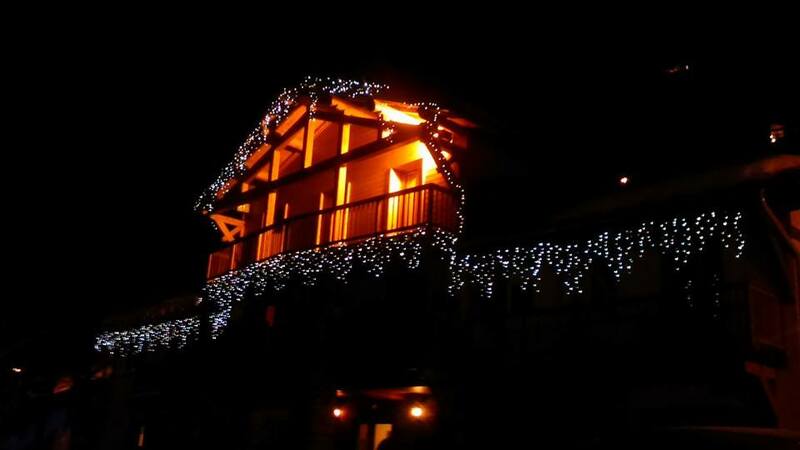 On arrival we were greeted by the homely lights of wooden lodges and chalets. 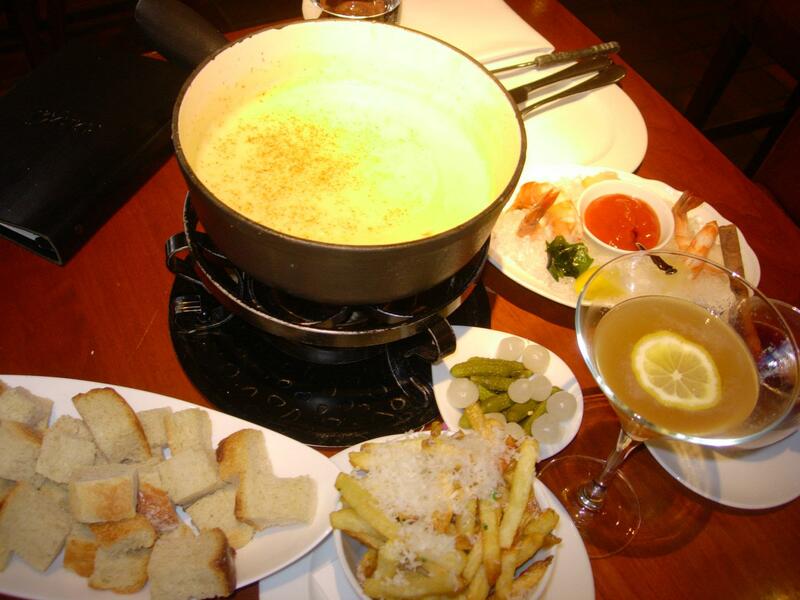 At the bottom was a fancy bar where I enjoyed a delicious Earl Grey lemon cocktail, truffle fries and fondue. 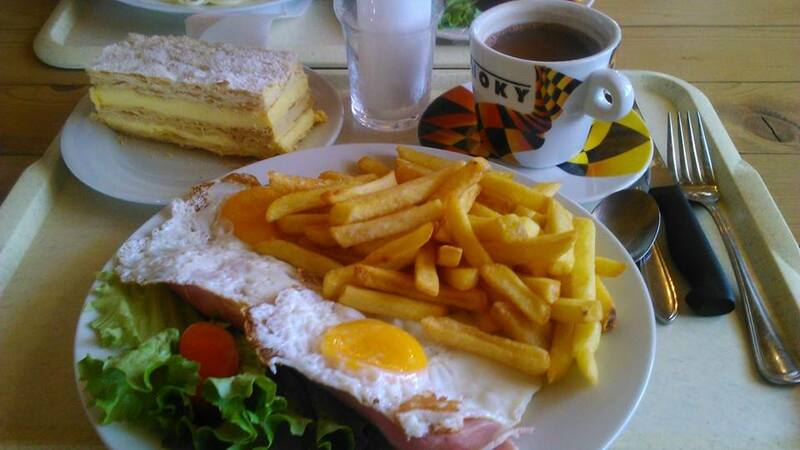 Maybe this sort of food is part of the reason behind it being named the Number 1 Resort in a ski magazine. 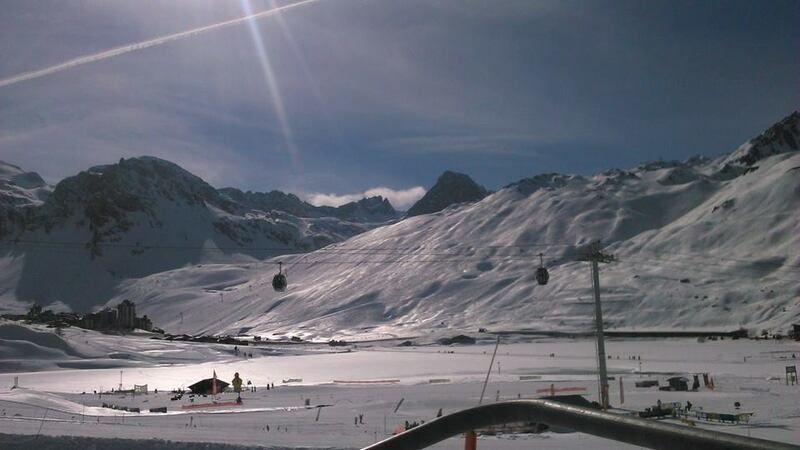 Apparently it is pricey though, a keen snowsporter told me it is £70 a day just to ski. Then we got on the 4 person gondola. 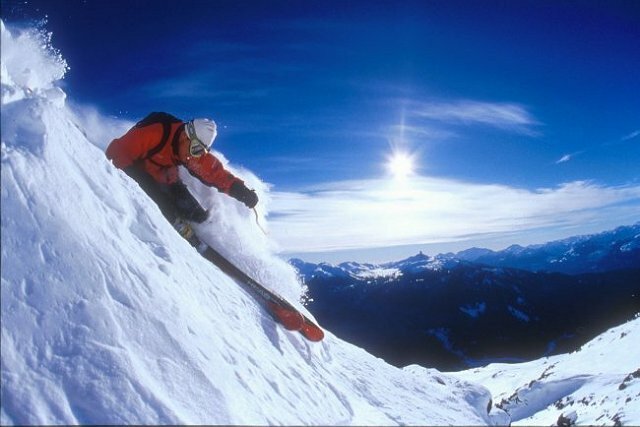 We travelled at a standard height to the top of Whistler Peak and I admired the sight of skiers zig-zagging and curving down the slope. It looked so exciting I wanted to hop off and try it. There was a father and son with us. The boy of about 7 had been snowboarding so much that he was already “better than me” the dad said proudly. The boy looked up admiringly. View from the glass floor of the gondola dangling above a mountain with no supporting post in sight. 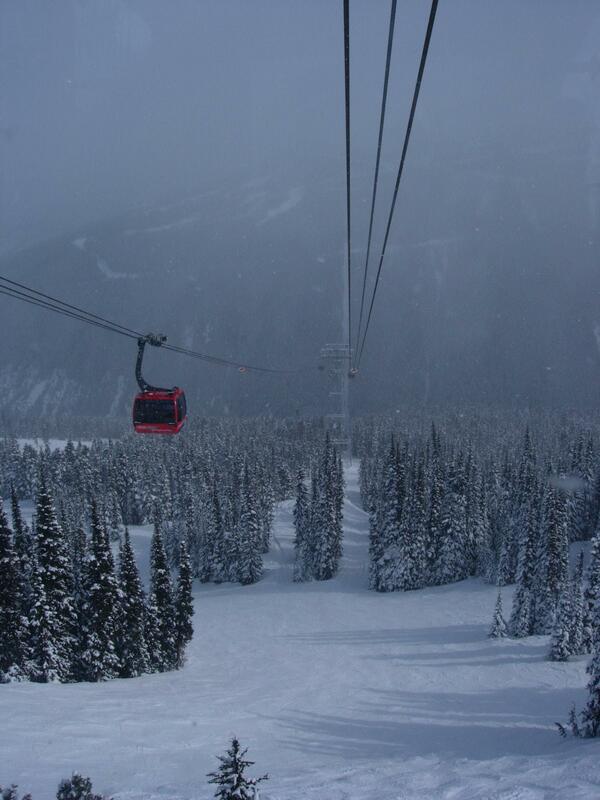 Then we carried on to Blackcomb – the peak opposite, in a 10 person gondola with a glass floor. 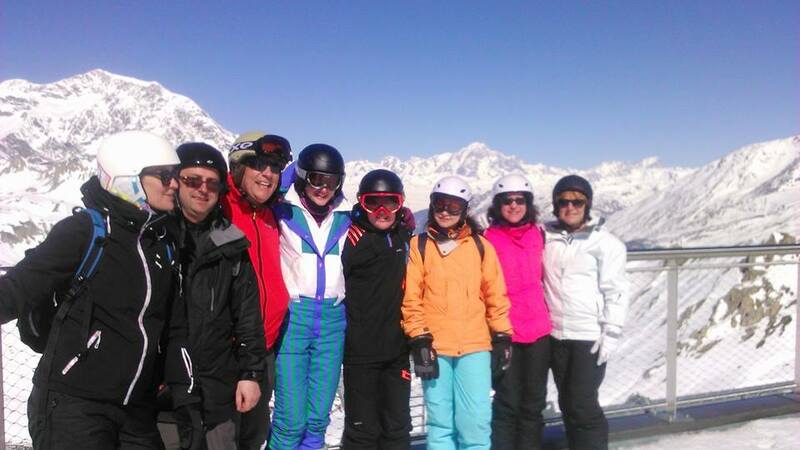 Skiers and snowboarders joined us, enthusiastic, chatty and exuberant from their alpine adventures. 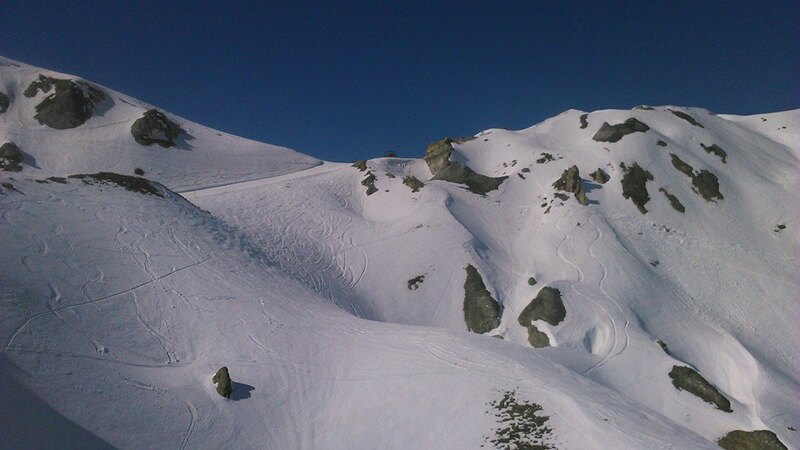 There were fir tree forests but even here there were people off-piste skiing, darting around in the sparser areas. 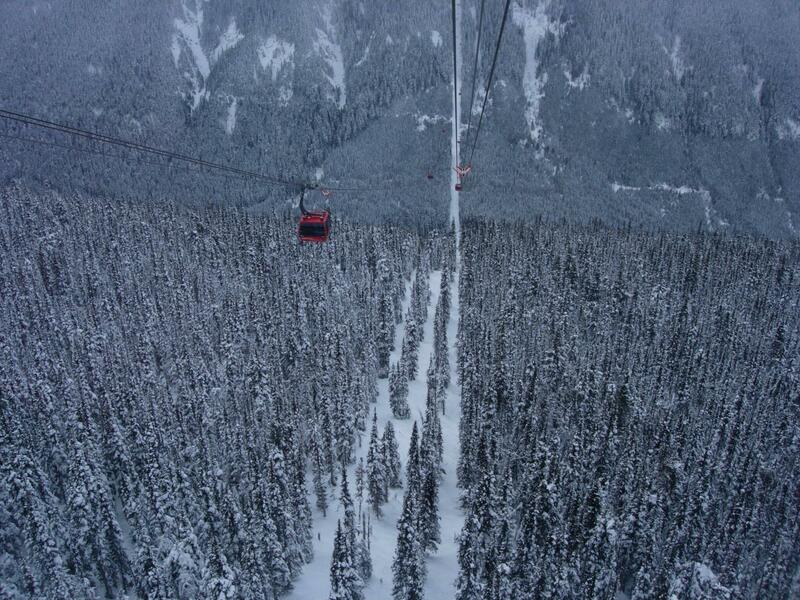 At the highest point the 10 foot trees looked like matchsticks and we could see the whole valley blanketed in snow. The phrase winter wonderland must have been inspired by this. I was quite nervous when we got that high, especially when someone said “I wonder what would happen if we fell now, look, we’re only supported by that wire up there, there isn’t another post for miles”. I imagine I wasn’t the only one who wanted to slap him. You should definitely put it on your to do/bucket list. I’ll never forget the experience. 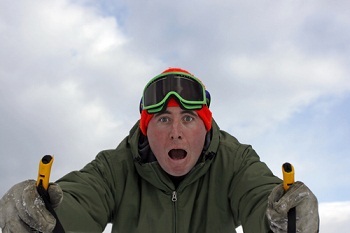 I wondered whether I would ever get the chance to try snow-sports as most people were already at intermediate stage that I knew or didn’t ski. People said it was risky, cold and expensive. Our holiday will cost more than £1,000 for a week just for the basics. An opportunity came round a few months ago when a new friend, Andy, a doctor working as a G.P. He said that he hadn’t been but wanted to as well. Perfect. 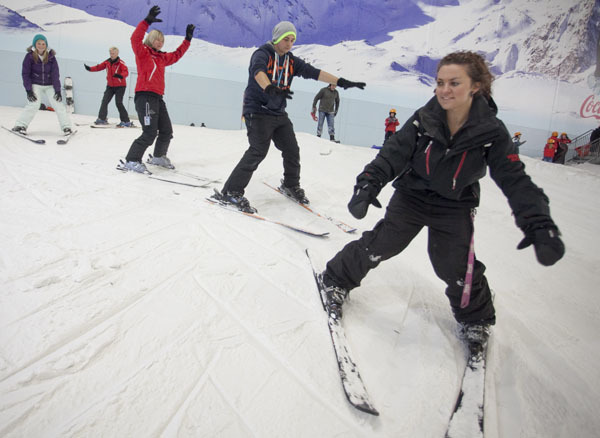 So we booked a pricey £175 day course at Castleford Xscape, an indoor slope with real snow, at -5 degrees Celcius. It would be 8 hours and I expected to be quite confident by the end of it, ready to go on to intermediate ones later. 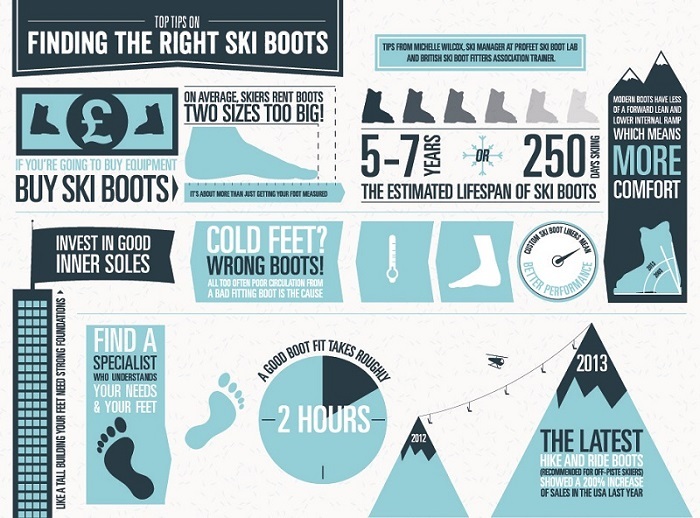 I was expecting to be fitted for skis and boots but it was every man/woman for themselves. I got the size of my feet but they were too small. I got the next size up but didn’t know how to put mine on, so I thought they didn’t fit. So I finally went back and the assistant thought my foot might have a high arch so gave me another pair which they said weren’t as good. It really wasn’t. It dug into the back of my leg and was quite sore after some hours. I went back and worked out myself how to get the boots on. You had to tear it apart to fit it. It’s even more important to get a good fit with them if you’re a woman – the structure of our knees means we’re more likely to get injuries. Skiis were heavier than they looked. Andy was getting frustrated with turns and got the instructor to give him some personalised tuition. The teaching was too general for me too. 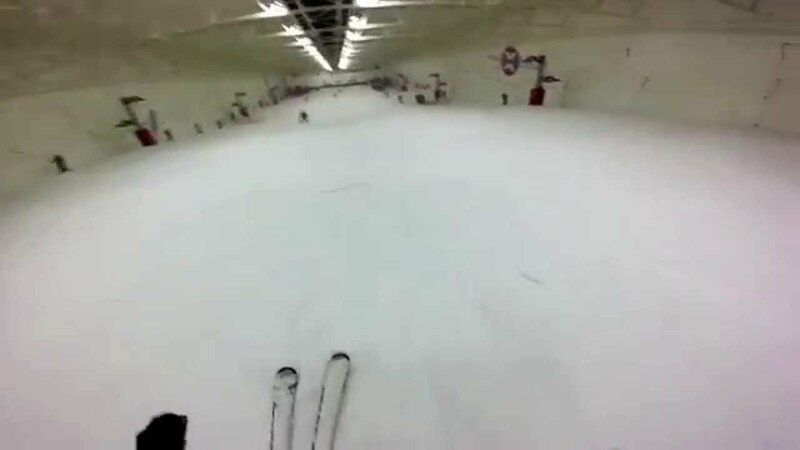 I was doing turns with snowploughs, which is where you make a pizza slice shape with your skis, the end of the slice being the front of your skis and then go back to parallel skis. Mine were fitted too long and I struggled to stop them crossing, which makes you fall. It was a gentle slope so we didn’t pick up much speed. We copied and were given the occasional tip. Then after a nice lunch around £7 of a burger and chips I had more energy for the beginner/intermediate bit of the lesson. 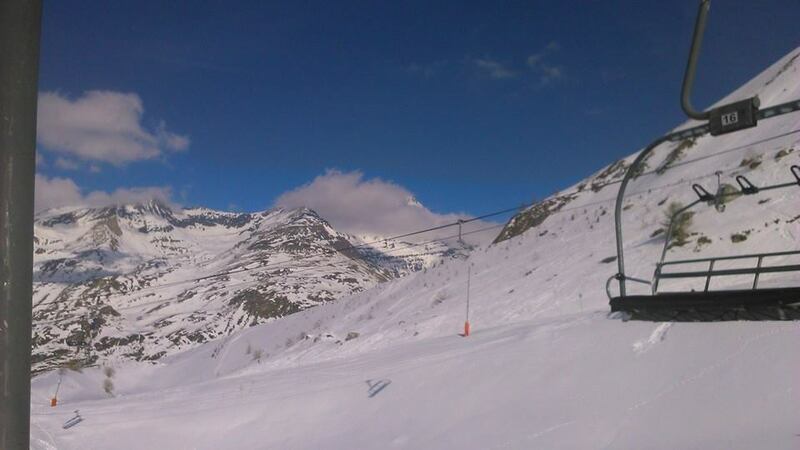 We spent a long time going from half-way up the main slope. It was higher but I still felt safe as although I couldn’t do parallel turns, I could do snowplough ones that slowed me down. We hadn’t been told anything about where your foot should be in the boot. 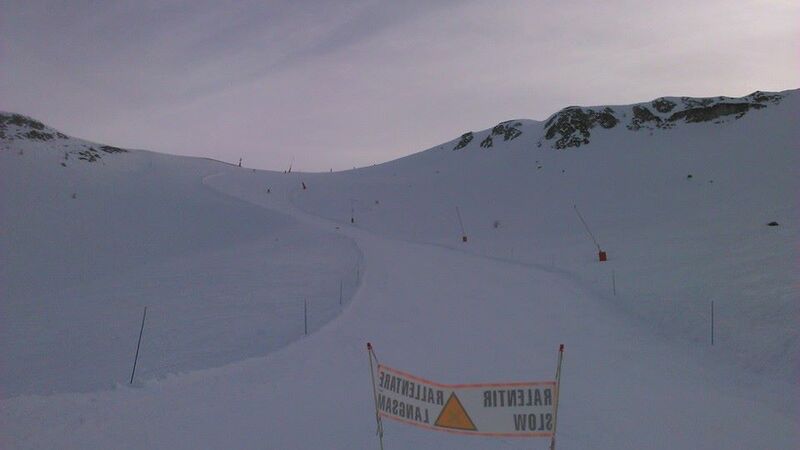 Parallel turns in skiing look easy but they are not for the beginner. Every time one foot would drag and I would do a triangle (snowplough) turn instead. It was getting frustrating. I asked for help but the instructor said I was fine. I didn’t feel like I was getting my money’s worth. 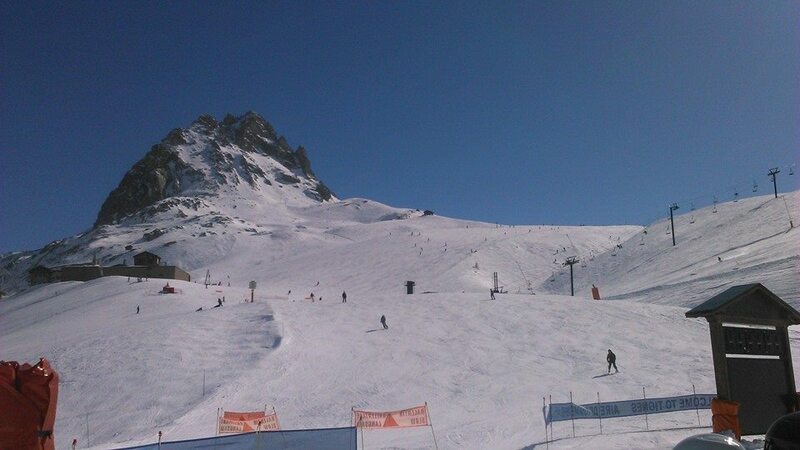 I’d been dreading going up to the top as it was higher than the highest slope I’d launched myself down sledging. Now I was on two tiny sledges attached to each foot and had far less control and surface area. If I fell backwards I might break my neck and that would be it. If I fell on one side I might dislocate something. Fall too hard and I might even break something. 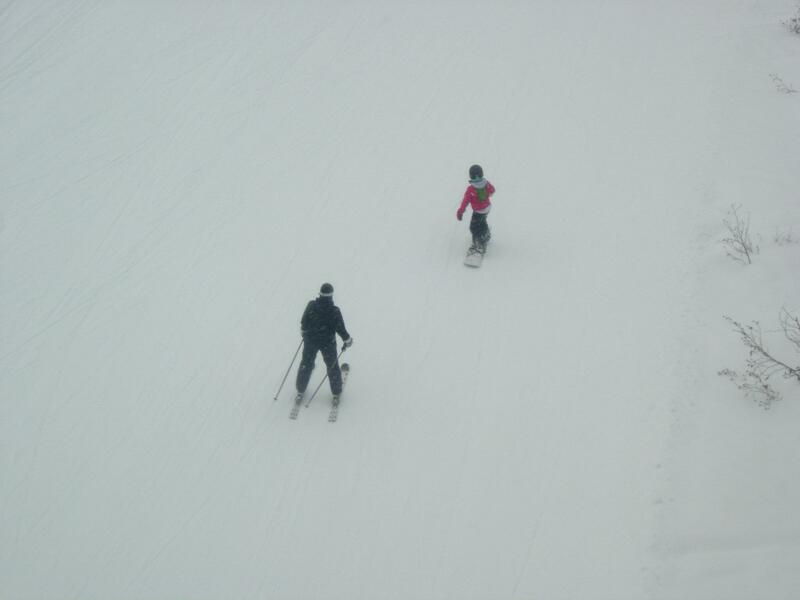 But the instructor told us to fall if we were going too fast or turn across the slope. 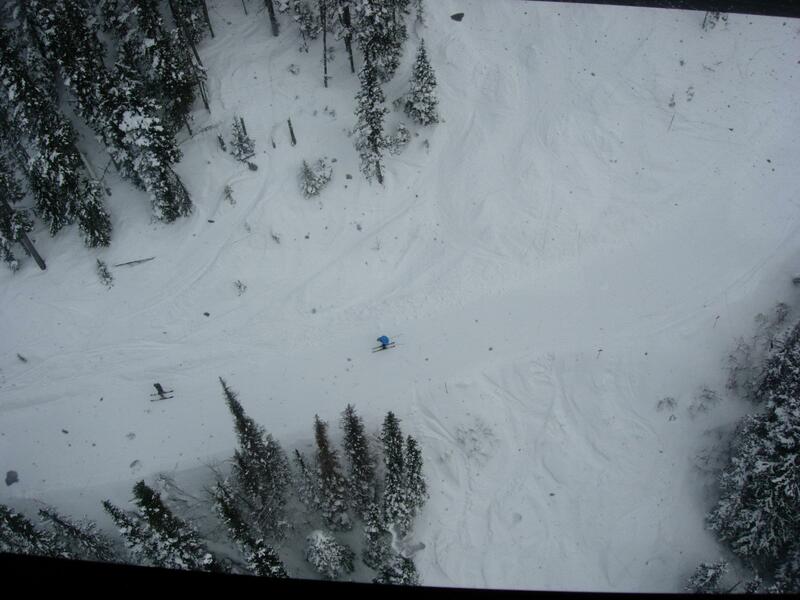 I fell off the pomola (seat for one person on a wire) on the first try and then couldn’t get up on my massive skis. Turned out I was in between sizes so they had fitted skis which were too long and I felt like Pingu ice-skating. 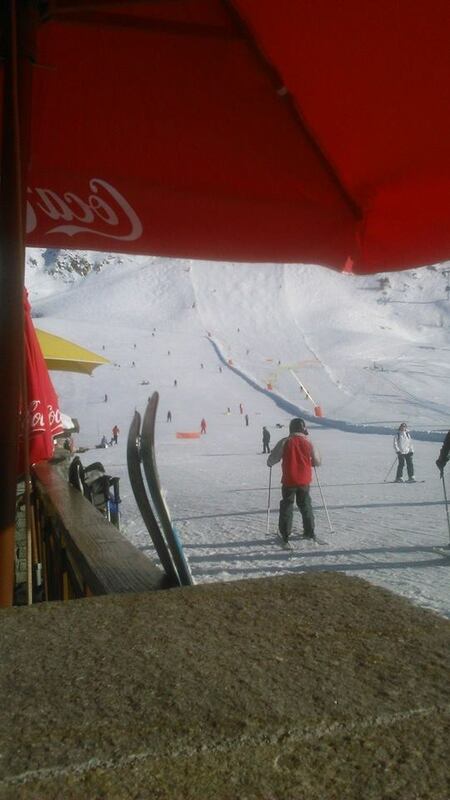 When I finally started down the slope I couldn’t see the bottom. It was terrifying, but what could go wrong? The instructor had said that he wouldn’t have taken us up there unless he was sure we were ready, so we shouldn’t worry. I didn’t believe that. He had a schedule to keep and he was going to carry on regardless. I didn’t feel my turns were developed enough but we were following him in loops so we would be fine…surely. 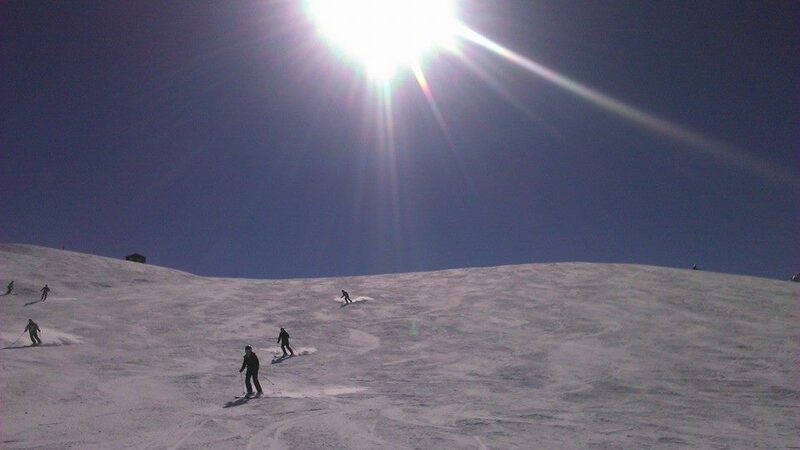 I did two turns and was just relaxing and thinking that maybe it wasn’t so bad after all when one foot wouldn’t turn. The edge had become wedged in the snow. I jerked my foot to free it. It came free suddenly and turned straight as it did. My other foot spun round with it and I was going straight. I looked at the teacher but his eyes were elsewhere. 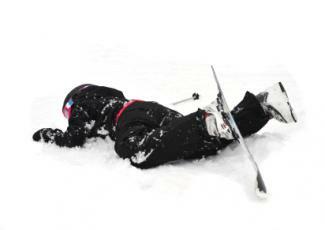 I’d be ok I thought, I’d turn across the slope. 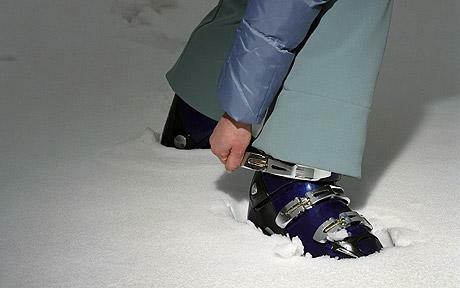 But when I tried to turn my feet in my boots one size too big (I was between sizes there too) they wouldn’t budge and I continued to slide down. My speed began to snowball and I started screaming at the top of my lungs. 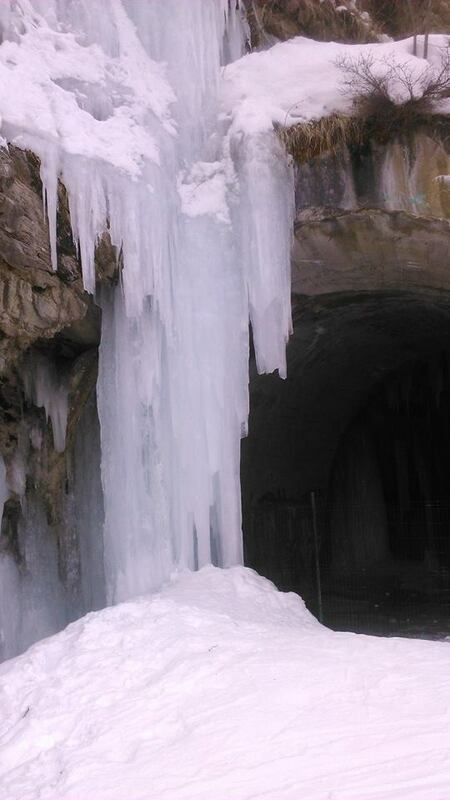 My eyes were watering at the blast of icy air, people were blurs and the slope seemed to clear as I hurtled down. I couldn’t turn and in the panic I didn’t know what else I could do. My experience was similar to this video but faster. An instructor later told us that the top speed down there is 35 miles per hour. 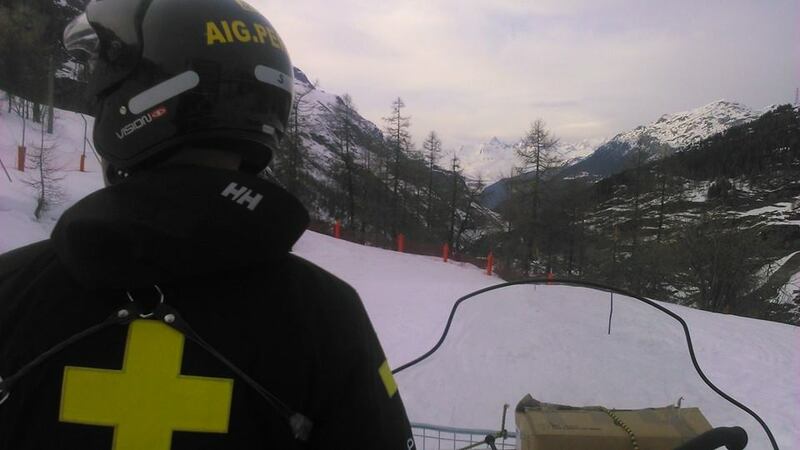 Suddenly three quarters of the way down, the instructor appeared and yelled “sit down!”. I was like a rabbit in the headlights so it took me a short moment to process it. But then I imagined breaking my neck as I fell over backwards. Should I roll? Then I might break something too. But before I could do anything the fence zoomed towards me and it was finally flat so I could turn. I braced myself and stiffened my shoulders. I’d hit it on the side to minimise injury. SMASH CRASH THUD THUD. My body was a projectile that collided with the wooden and (thankfully) plastic mesh fence. I hit it on one shoulder, grabbing for the mesh to slow the impact. The force of it rotated me and I hit it on my other shoulder and cut my chin on the plastic, such was the speed. The impact then threw me backwards. The staff responded immediately, three of them running in on all sides. One instructor I’d chatted to earlier, a tall guy with black-framed glasses and black spiky hair kindly asked questions. He reminded me of the actor Jeff Goldblum. I said I had a sore neck and started crying at the idea that I might be paralysed just from this. 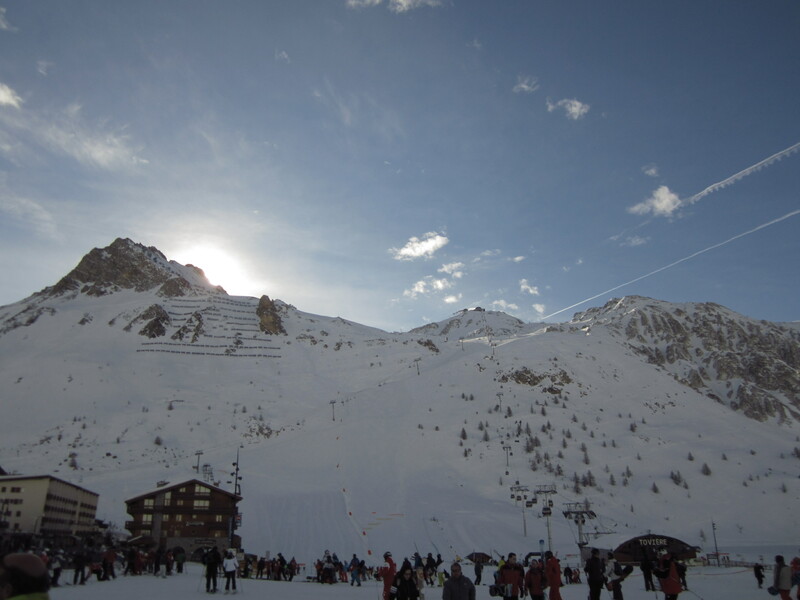 But as I lay on the snow with everyone gathered around I realised that it was an ache not a sharp stabbing pain like a broken bone as someone ran up next to me with a spinal board. “I’ve just sprained it” I said weakly. Should I test it out or was that too risky? What the hell, I didn’t want to be carried off and create even more of a scene. I sat up suddenly and bent my neck. It was sore but thank goodness, not fractured. The staff gently pushed me back down. Andy appeared. “I’m a doctor” he announced and everyone visibly relaxed and looked to him to sort things out. He asked how I was. I tried to get up and this time they allowed it, helped by three staff. My boyfriend appeared. “Are you ok?” “Yes” I whimpered, as Andy and the first-aider helped me to the first-aid room. The health and safety officer was a young girl with dark eyes and hair scraped back into a small ponytail. She was brusque and dismissive. It was clear that I’d embarrassed them with this accident which required an incident form and a bump note. Andy did tests for broken bones and they were negative. He thought my nose might be broken because it looked bruised but he felt it and it was fine, just dirt from the fence. The girl wiped the blood off my chin. It bled again but she didn’t notice as she was busy getting my account as briefly as possible. She clearly wanted it over and done with but looked sympathetic as she told me I was the fourth person to hit the fence that month. Andy had to ask for a plaster as blood was slowly pooling on my chin. I’d bit my lip as I crashed and that was stinging a bit. There wasn’t enough blood for it to drip onto my mum’s ski suit luckily. There were only bandages and massive blue plasters in the first-aid box. The instructor came in as I was giving my statement, apologising. “Why didn’t you sit down?” he asked. He asked if I really needed the plaster. I said they’d had to put it on as my chin wouldn’t stop bleeding. He went out, saying he’d come and see me afterwards. Finally my boyfriend appeared. He said he didn’t want to crowd me. When he’s hurt he doesn’t like too much attention but likes to “get on with it”. The first-aider refused to let me complete the last hour of my lesson so I went upstairs to the cafe in a huff and sat at the window watching Andy confidently winding down and my boyfriend having fun. He looked up often which was nice. When I booked the last hour days later, the receptionist stated how much it was. Although staff had said they’d make a note on the system they clearly hadn’t. I said I hadn’t been able to do Lesson 5 as I’d crashed and hadn’t been allowed to complete it. She said she wasn’t sure if I could get it for free and that she’d check. After speaking to an instructor she booked me in. 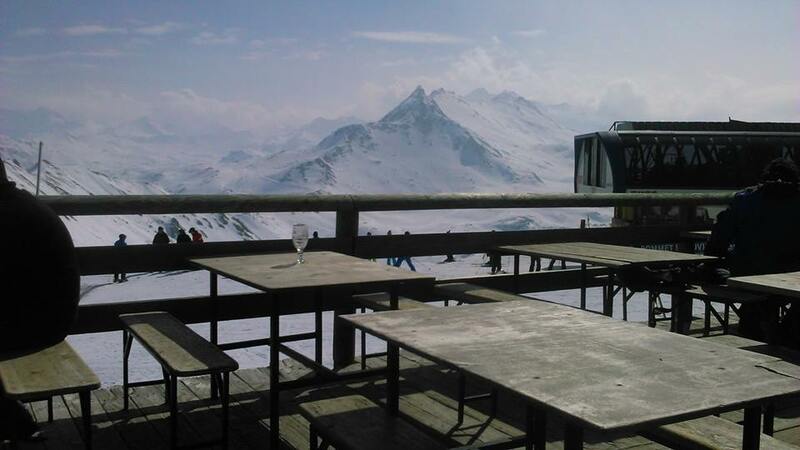 When I went back two days later I was in the 9pm slot on a weekday so it was wonderfully quiet and I didn’t have to worry about what other skiers/snowboarders were doing and whether we’d collide. 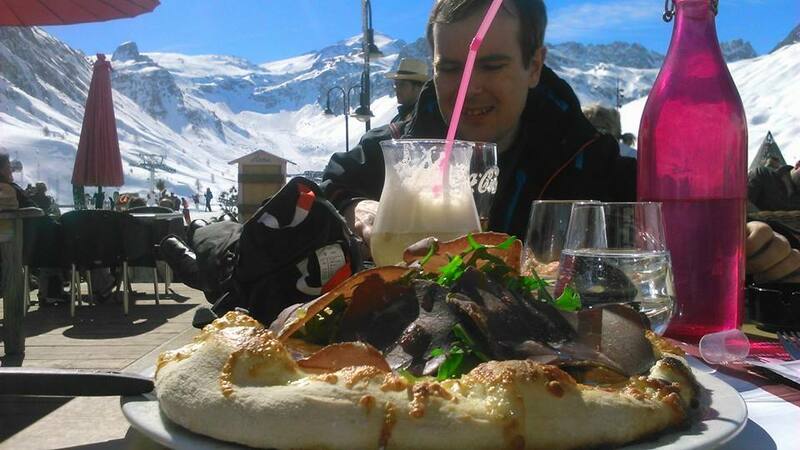 My boyfriend was going to ski but at £25 (the same price as an hour’s lesson) even off-peak he didn’t bother. I built up confidence and faced my fear, pointing myself towards the bottom of the slope from the top but in a snowplough so that I could slowly turn. The coaching was personalised in that I got two tips in the hour but it was mostly again a matter of copying the instructor. 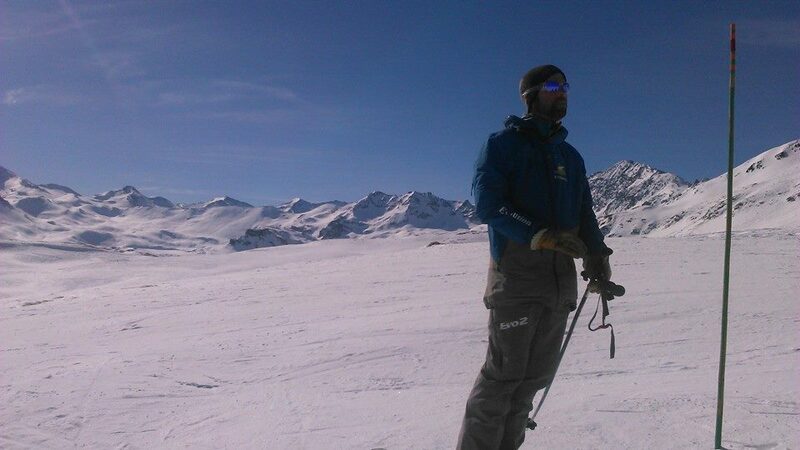 Unfortunately we couldn’t see what his feet were doing in his ski boots, which is probably what prevented me from improving the last time. You need to know where to put your weight in your foot. You need to literally be on your toes when you turn. My boyfriend gave me useful tips on the way there that would have been useful in training. My arms and shoulders were achy, my knees had purple bruises, my chin had a Harry Potter mark on it and there was a red spot on my nose but I’d been really lucky. At least the incident support was great and I didn’t get any serious injuries. I didn’t get too confident or foolhardy and now I know what can go wrong I won’t take risks but will slowly build up my skills. 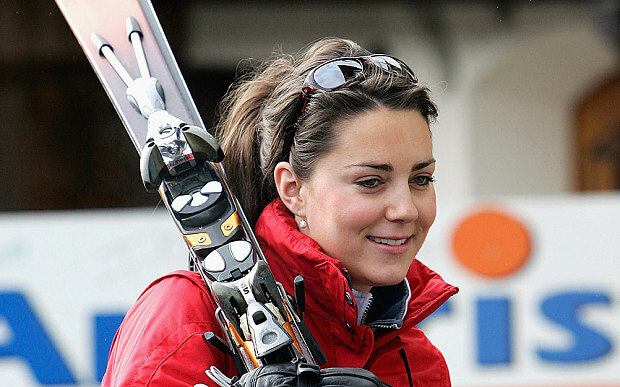 The beautiful Kate Middleton is a skiing fan. She was first spotted kissing Prince William on a ski holiday.